A 12oz can of Coke = 140 calories. There are many ways to burn those calories through EXTRA physical activity and have fun while doing so. Balance your lifestyle. Be OK. Open happiness. So professional. So brilliant. So smart. And so deceitful. Seven percent of our calories come from soda - it's the biggest single source in our diet. And the most harmful. It's good that Coke recognizes that and is beginning to apologize. But all calories are not the same - those from soda and other sugar-sweetened beverages are actually worse than others. So it's up to us to remember that Coke makes its money selling sugar-sweetened beverages, and even when they're apologizing for that, as they appear to be doing here - they're still selling them. Even though we're reduced the calories per serving, these beverages can still cause kidney problems, obesity, metabolic syndrome, cell damage, and rotting teeth. Which leaves 470 beverages which have extremely high, unhealthy levels of calories. Boom. What else ya got? All calories are not the same. And the calories in Coca-Cola products have no nutritional value. If you choose to live a healthy lifestyle, then you should not be drinking any of our products. Oh, and Coca-Cola also fails to mention that Diet Coke can lead to depression and cause weight gain. Look, obviously Coca-Cola is not the sole reason for the so-called obesity epidemic. (Let's not forget there are experts who insist there is no obesity epidemic.) But the fact remains that Coca-Cola manufactures extremely addictive products and has spent billions marketing and advertising them over decades. Show a red and white Coke can to kids who can't read and they know exactly what's inside. I know! I was one of those kids. I try, on and off, to break my Coke habits, and just find myself going back, again and again. What's weird is this: Coke is not obligated to discuss obesity, or whether a can's calories are happy or sad. But by doing so — tapping into the national conversation surrounding sugary drinks and obesity — Coca-Cola is attempting to appear caring and responsible. When all the corporation really cares about is cash. 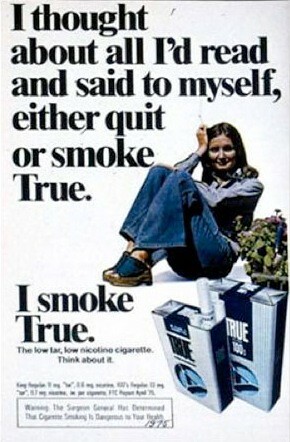 It's reminiscent of the low tar cigarette ads in the '70s and '80s. It's like hey, this thing will kill you, but not as bad as this other thing will kill you. So keep on buying! Except what happens is, the ad forces you think of the negative aspects involved. So now, even though Coke's message is "don't stop buying Coke, we love you," I can't stop thinking about obesity, rotting teeth and the "EXTRA" "happy" calories the can represents. I think I'm quitting Coke. Again.